“COMMUNISM IS A LIE. DEATH IS A PREFERABLE ALTERNATIVE TO COMMUNISM. DEMOCRACY IS NON-NEGOTIABLE.” – Liberty Prime, Fallout 3. Fight the red scourge by enjoying this capitalistic vidya game news! – Good news for Todd Brisket! 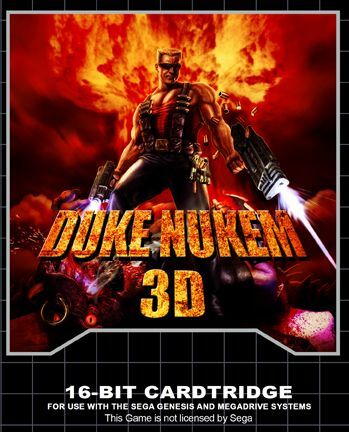 The Sega Genesis version of Duke Nukem 3D is now available. – On Digg, an amazingly “so bad it’s awesome” commercial for the Atari 5200. It features some legitimately hot, way too enthusiastic babes in bikinis! Check it out here. – Pretty much every major tech site had some sort of piece on the 30-year anniversary of the NES, but Mashable had a neat retrospective on the 18 launch games for the system. Among them: Donkey Kong Jr. Math, Wrecking Crew and Clu Clu Land. – Nintendo has opened up its development process slightly, and it’s also quietly sending out development kits for its next system, according to several different websites. – From many different sites, but created by Sports Illustrated’s Cauldron, it’s the Colts bizarre fake punt recreated in Tecmo Super Bowl – view it on YouTube. – There could be a new Valkyria Chronicles game in the works, as Sega has registered the name Valkyria of the Battlefield with the Japanese patent office. – My Parents’ Basement is a new restaurant open in Avondale Estates, Georgia. For a review, click here, and the restaurant’s website is here. – Grand Theft Auto 3 was released 14 years ago on the PS2, which was followed by PC versions in 2002 and Xbox in 2003. It was the first REALLY good game of the series, and as of 2011, it had sold more than 17 million copies, in addition to being the best-selling game of 2001.